"Loss, Love & a Book Through the Eyes of an 11-Year Old"
Zoey Hess will be speaking with groups beginning this summer about her book and helping others to cope with the loss of a loved one by connecting to their loved ones, even after they’re not living on Earth. To invite her to speak at your event, email our team. 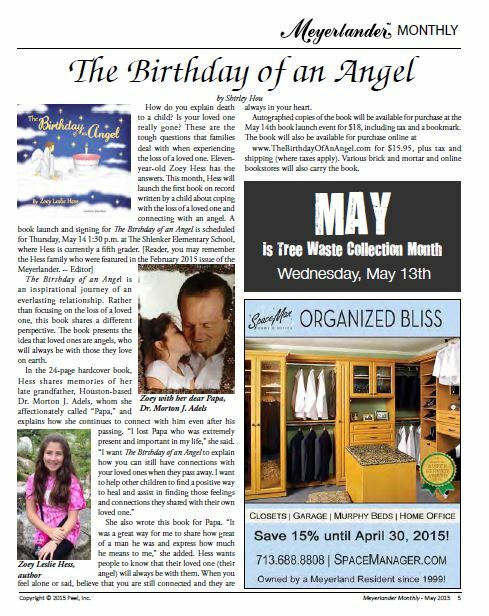 “The Birthday of an Angel chronicles the special bond between a little girl and her Papa and the ways she has been able to continue that bond after his death. Using her own experience with grief as a guide, Zoey Hess has written a sweet and insightful book that is sure to help children of all ages find ways to feel connected to their loved ones who have died. At Bo’s Place, we believe that sharing experiences with others in grief helps individuals navigate the grief journey and move towards hope and healing. The Birthday of an Angel does just that.”"